For the latest in our occasional series on the Saints of the Roman Canon, here are some pictures of St Lawrence. He was one of the seven deacons of the Roman church under Pope St Sixtus II, who was martyred only a few days before him, in the reign of the Emperor Valerian (253-260). He is one of the most celebrated Roman martyrs. Lawrence is generally shown wearing the deacon’s vestment, the dalmatic, and holding a book of psalms, and alms for the poor. He also appears with the general symbol of martyrdom, the palm branch, and his specific symbol, the grid iron on which he was tortured to death. You can read about his life on New Advent here. Above, St Lawrence painted by Spinello Aretino, (Italian, 14th century), and below, by Bernardo Strozzi, (Italian, 17th century). 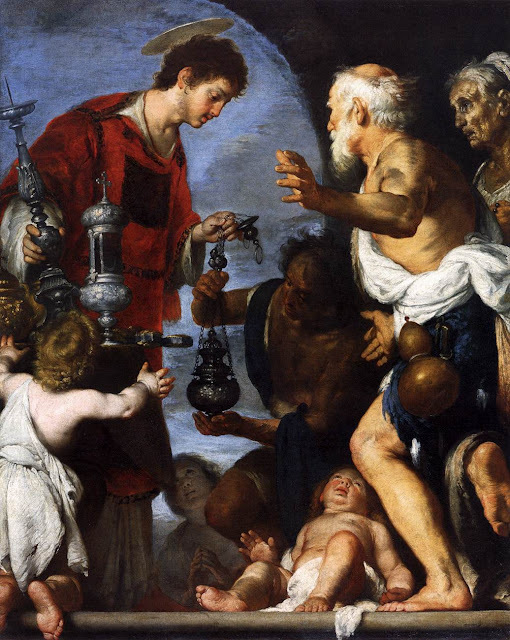 The Strozzi painting is called The Charity of St Lawrence, since as part of his duties as deacon, he distributed alms and the treasures of the church, that were coveted by the Emperor. Lawrence continued to distribute alms, and told the Emperor that the poor themselves were the real treasures of the Church. 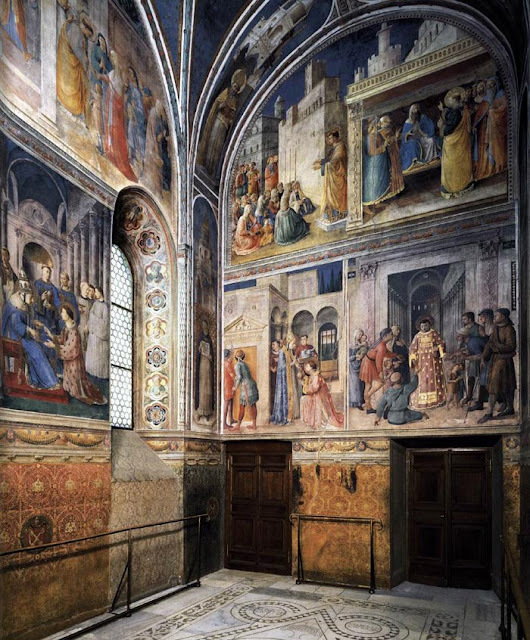 And finally, in the Niccoline Chapel in the Vatican, there is a series of frescoes painted by Fra Angelico. This is one of a series of articles written to highlight the great feasts and the Saints of the Roman Canon. All are connected to a single opening essay, in which I set out principles by which we might create a canon of art for Roman Rite churches and a schema that would guide the placement of such images in a church, which you can read here. In these essays, I plan to cover the key elements of images of the Saints of the Roman Canon (Eucharistic Prayer I) and the major feasts of the year. For the fullest presentation of the principles of sacred art for the liturgy, take the Master’s of Sacred Arts: www.Pontifex.University.